MN stands in solidarity with Muslims as Supreme Court case approaches | Fight Back! Minneapolis, MN - On April 21, around 100 protesters rallied at the busy intersection of Lake Street and Nicollet Avenue in Minneapolis, holding signs that read, “No Muslim ban ever,” “No U.S. bombing Syria,” and “Stop the war on Muslims at home and abroad.” The rally was organized by the Minnesota Anti-War Committee and the Minnesota chapter of the Council on American Islamic Relations (CAIR) to send a message of support to the Muslim community in anticipation for the upcoming Supreme Court hearing on the Muslim ban. Protesters rallied for an hour and half and then held the busy intersection in an act of defiance. No arrests were made. At the rally there was a wide variety of speakers including Jaylani Hussein, the executive director of MN CAIR, Misty Rowan of the Anti-War Committee, civil liberties and immigrant advocates, and leaders from the Japanese American and Dakota communities. Mike Madden, a longtime member of Veterans for Peace, who was arrested in January 2017 for holding a sign that said, “Muslims welcome”, also spoke to the crowd. He is facing a charge of criminal trespass at a critical public service facility and if he is found guilty he could face up to a year in prison and a $3000 fine. His trial was supposed to start on April 23 but he announced at the protest that it has been delayed until June 4. Rally organizers asked the crowd to be ready to support Madden in June and pack the courtroom to show support for him and the right to protest. 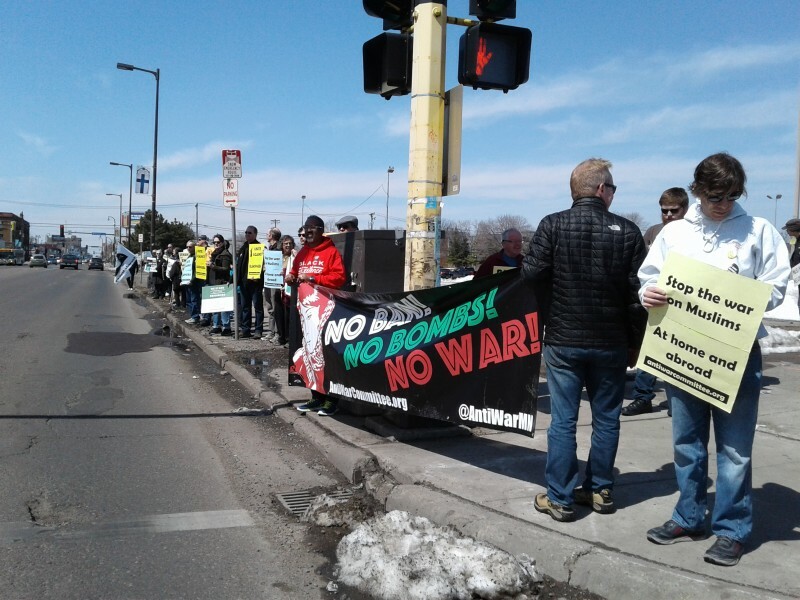 On April 23, the MN Anti-War Committee and CAIR will co-host a forum at 7 p.m. at Bethany Lutheran Church in Minneapolis so that community members will be well informed about the significance of the case and how the Muslim ban affects the large Somali community in Minnesota.